Happy Birthday America! Bring Dippin’ Stix to your celebration and put a festive spin on it! 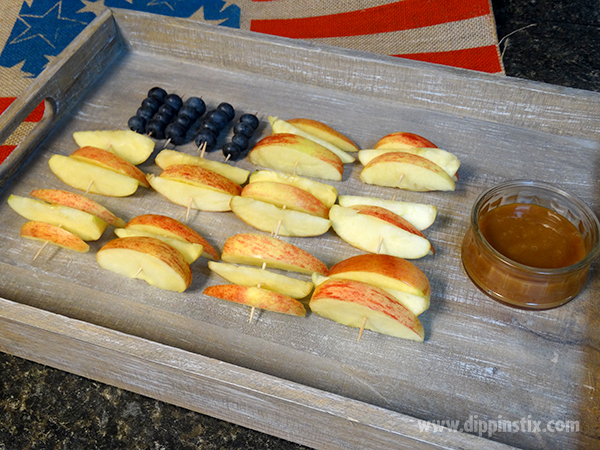 Create this easy & fun to make Apple American Flag. 1. Place blueberries on 5 toothpicks. Alternate 3 apples per toothpick (skin down, skin up, skin down) to create the rows of the flag. 2. Serve up these bite size snacks with the caramel from the Dippin’ Stix trays.